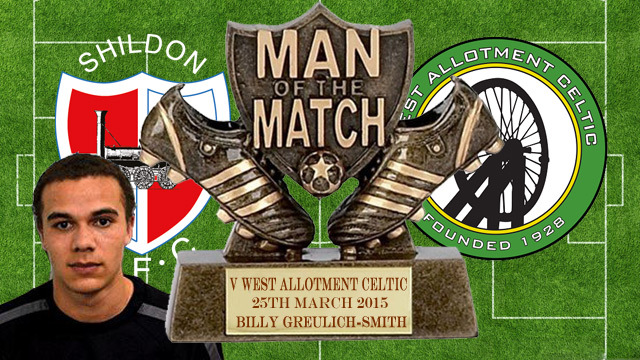 Shildon AFC are now 3rd in the league with games in hand after a 2 – 0 home win against West Allotment Celtic on Wednesday 25th March 2015. The game was won within the first few minutes with the Railwaymen scoring twice. The first came on 5 minutes when John Brackstone headed in a right wing cross. On 9 minutes Paul Connor cleverly wrong-footed three defenders and then the keeper Ryan Beal, to score a great individual goal for 2 – 0. Although to was all Shildon, near the break Celtic’s Marc Walton fired wide from the edge of the box. The 2nd half was a dull affair with very few scoring chances from either side. On the hour Celtic’s Liam Anderson was through but miss kicked. Then Celtic’s Marc Walton headed over before they were down to 10 men on 78 minutes when Marc Dummett was red carded for a bad tackle on Sam Hodgson. Near the end Shildon’s Mark Doninger hit the post. Goalscorers: Brackstone 5, Connor 9. Subs: Chapman for Greulich-Smith 65, Taylor for Hudson 75. A poor game to watch, but a win is a win, and we move on to the next match which is at home to Penrith on Saturday 28th March 2015.